Dr. Bob Fisher, president of Belmont University, was announced last weekend as this year’s recipient of the Robert E. Mulloy Award of Excellence, and the presentation was made at the beginning of the Best of the Best showcase held on Be Belmont Day. The Robert E. Mulloy Award of Excellence is a Curb College tradition that preserves and honors the memory of Bob Mulloy, the founder of the music business and entertainment programs in the Curb College. 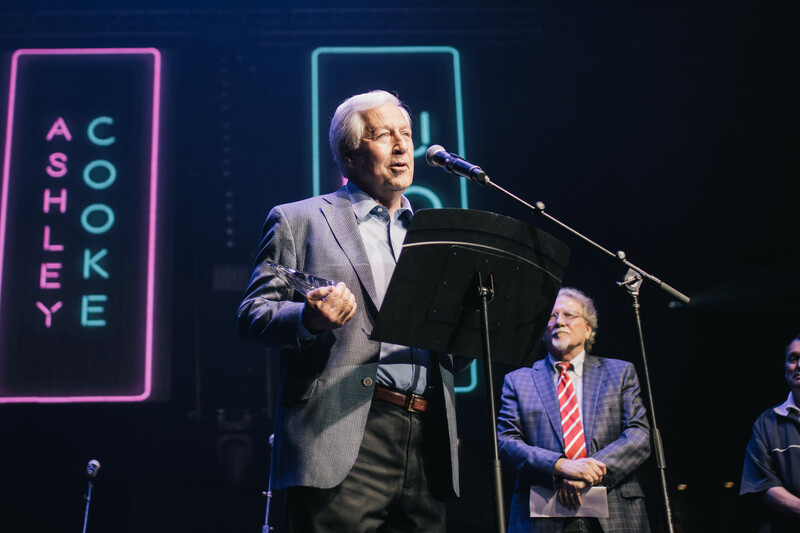 The Mulloy Award seeks to highlight and honor an individual or an organization who has had an important impact on the entertainment industry, and in addition, has displayed notable service to Belmont University and to Nashville. Past honorees include legendary music publisher Donna Hilley, Grammy award winning artist and Country Music Hall of Fame member Vince Gill, Curb Records/Publishing owner Mike Curb, Sony/ATV Music Publishing president Troy Tomlinson, Grammy winning writer/producer Gordon Kennedy, Grammy and Academy of Country Music award winning engineer/producer Chuck Ainlay and organizations that include The International Entertainment Buyer’s Association, Clair Global and Bandit Lights.